After years of struggling, the Selma City School district is hoping to start a new chapter by appointing Angela Mangum as the district’s new Superintendent. Randall and Betty Miller defied local custom and married in Selma, Ala. during a time, 25 years ago, when racial tension was still high. Each year in April, a month after celebrating the voting rights victories achieved in Selma, the town hosts the Battle of Selma Re-enactment festivities. Bridging Selma presents an extraordinary opportunity for a troupe of journalism students and faculty from Morgan State University and West Virginia University to engage in an experiment in social justice reporting. Ground Zero – Selma, Alabama – is our classroom. Our method is to look at Selma today through the prism of the past. Bridging is our metaphor — Bridging historical divides of race by reporting on the real outcomes of the hope and promise of political, economic and educational opportunity of 50 years ago. Bridging cultures – how students and faculty from a historically black college and those from a rural, predominantly white school can explore the difficult issues surrounding both their diversity and commonality. Our goal is to empower young journalists to collaboratively confront issues of race and representation, and to instill in them a critical agency over that narrative. Our objectives are to sensitively explore and advance an essential dialogue on race and justice, and to create an immersive environment where students can learn from each other as they accelerate their journalistic and reporting skills using emerging technologies. Morgan State University is a historically black university with 7300 students in the heart of Baltimore, Md. At Morgan, the newly founded School of Global Journalism and Communication has launched an initiative to get students out of the classroom and into the community to do shoe-leather reporting on the social justice issues of the day, in particular issues affecting the black community. The school is committed to giving students practical, hands-on experience by providing meaningful, faculty-guided projects that encourage them to experiment and practice the multimedia skills they are learning in the classroom. Thus armed, they can make a difference in the world. The West Virginia University Reed College of Media is a student-centered school that has been graduating journalists and strategic communicators since 1939. The College offers innovative curriculum and real-world experiences that prepare students for 21st century media. 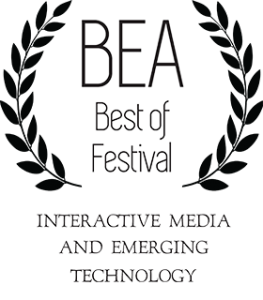 In all programs students learn by doing, producing stories and hands-on projects that use the latest digital media technology. 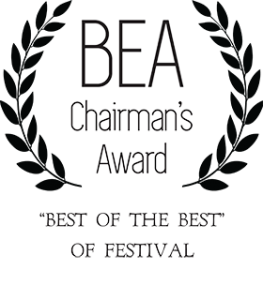 Our program also has a deep history of social action projects, and we are recognized for exhibiting a willingness to experiment while holding true to our core pursuit of media that matters. 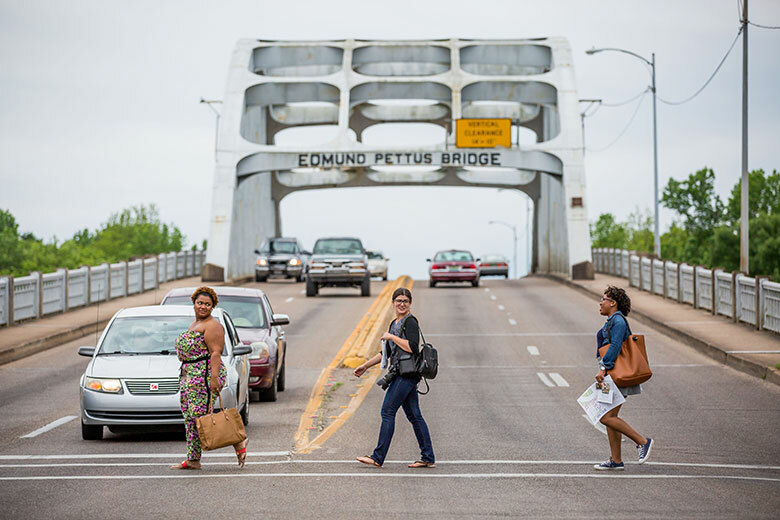 Morgan State students Camille Harrison, left and Asha Glover, right, cross the Edmund Pettus Bridge with WVU student Colleen Good while reporting for the Bridging Selma project in Selma, Alabama. 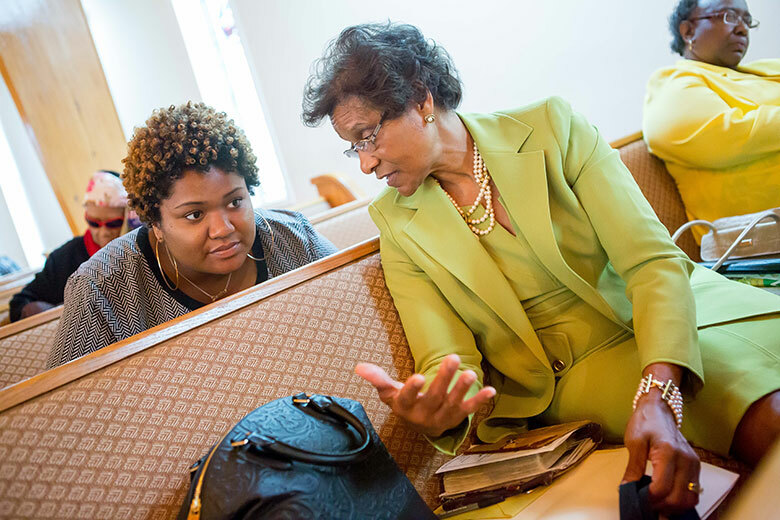 Morgan State student Camille Harrison, left, speaks with …. during services at Ebenezer Missionary Baptist Church while reporting for the Bridging Selma project in Selma, Alabama. 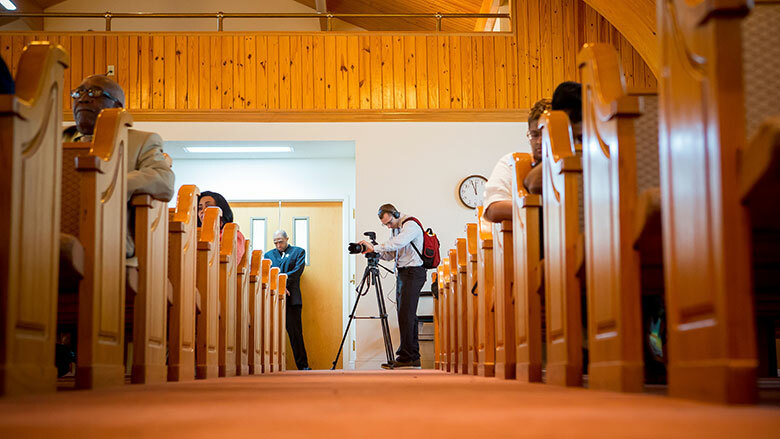 WVU student Doyle Maurer films during services at Ebenezer Missionary Baptist Church while reporting for the Bridging Selma project in Selma, Alabama. 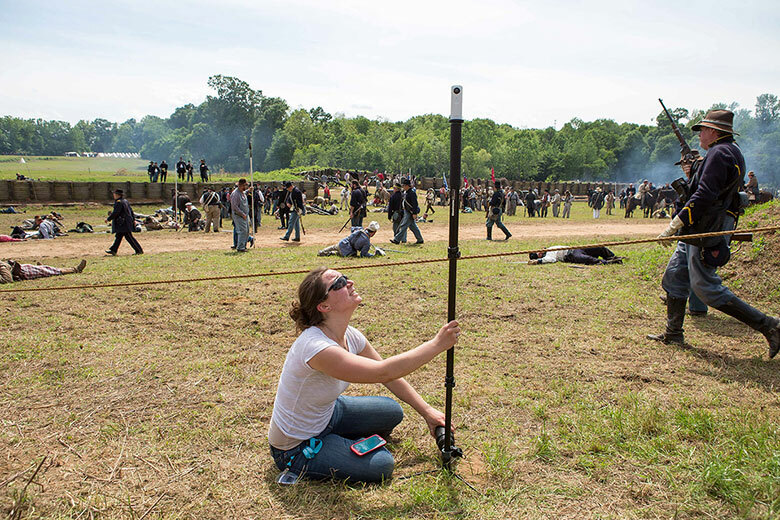 Morgan State student Emily Pelland takes a panoramic photo during the reenactment of the Battle of Selma for the Bridging Selma project in Selma, Alabama. 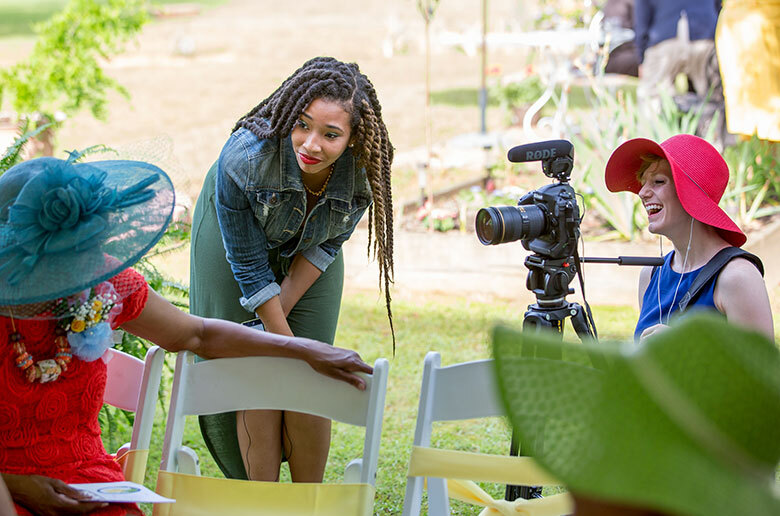 Morgan State student Ahjahnae LaQuer, center, and WVU student Erin Irwin interview a local resident at a garden party in Selma, Alabama while reporting for the Bridging Selma project. The party was hosted by Betty Miller, a community leader who works to bridge the divide between the black and white communities in the town. 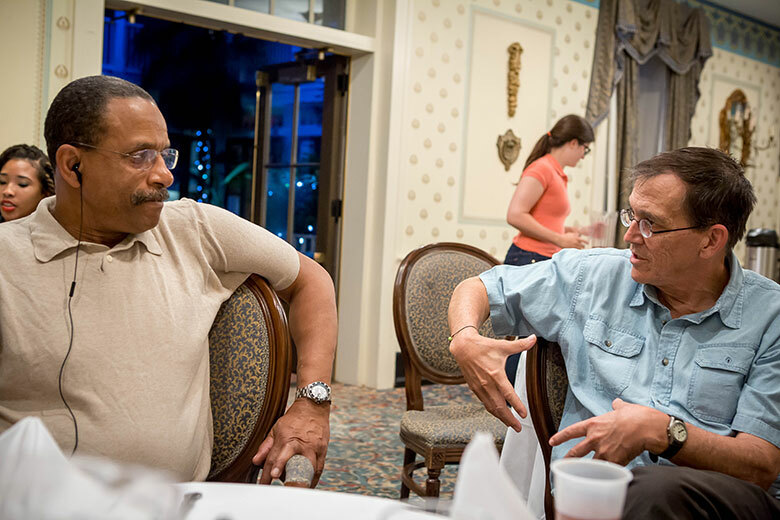 Morgan State University professor Ron Taylor discusses a story with WVU’s Joel Beeson during a break working on the Bridging Selma project in Selma, Alabama. 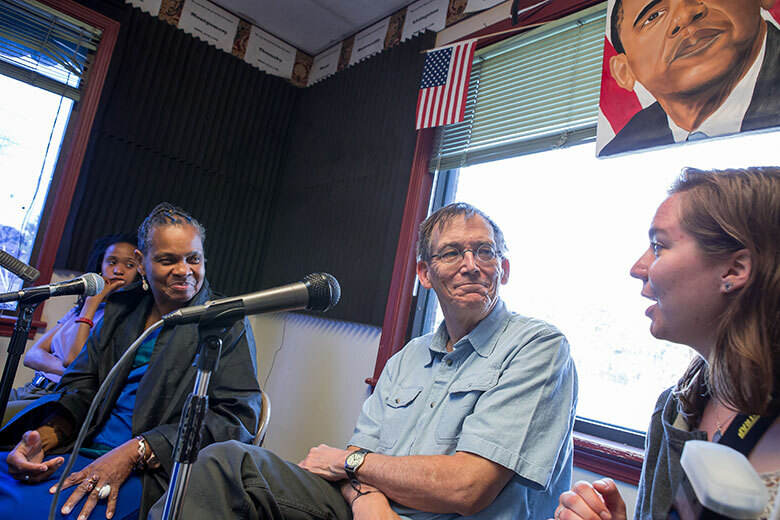 Morgan State student Emily Pelland, right, and WVU professor Joel Beeson join Faya Rose Toure on the “Faya’s Fire” radio show on 105.3 in Selma Alabama. Rose is an outspoken civil rights advocate and invited the pair to appear on the show while they were in town working on the Bridging Selma project. 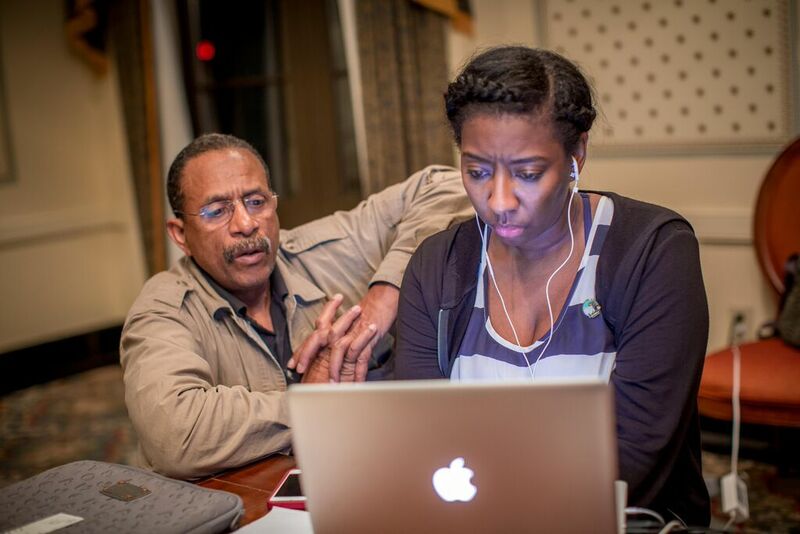 WVU Teaching Assistant Professor Mary Kay McFarland helps WVU student Doyle Maurer edit video at the St. James Hotel in Selma, Alabama while working on the Bridging Selma project. 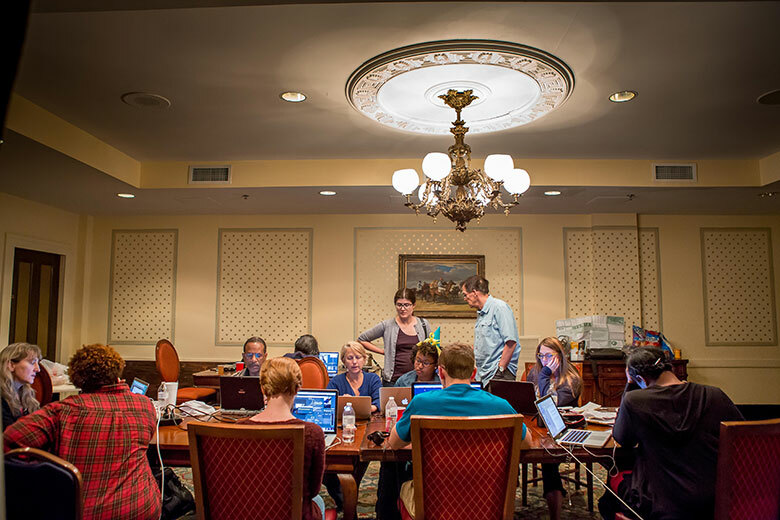 WVU and Morgan State students work late into the night at the St.James Hotel in Selma, Alabama while reporting on the Bridging Selma project. 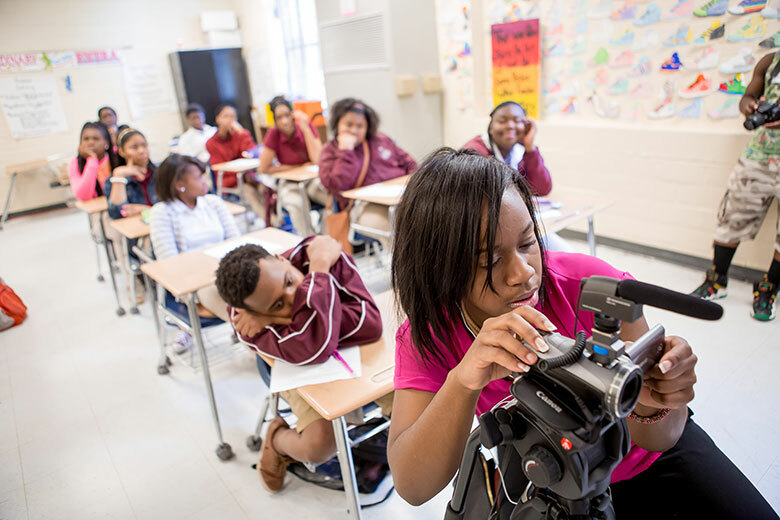 WVU student Shaleah Ingram films in an elementary school classroom while reporting for the Bridging Selma project in Selma, Alabama. 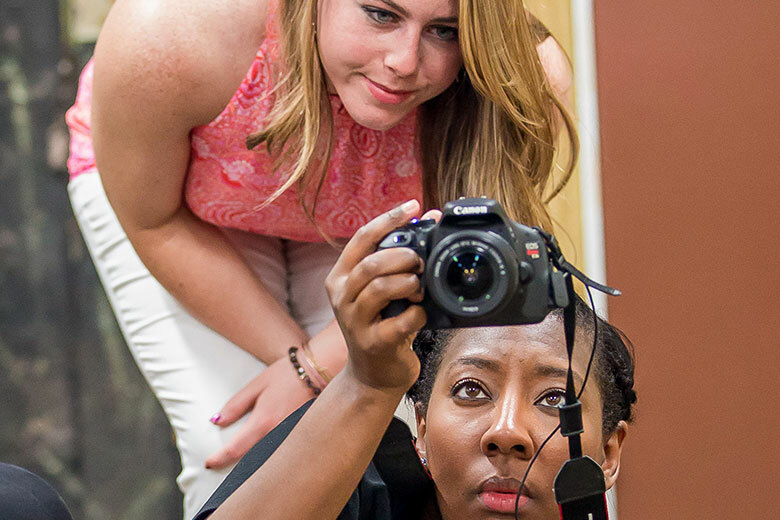 WVU student Kelsey Staggers, top, and Morgan State student Maya Gilmore film while reporting on a local coffee roasting company for the Bridging Selma project in Selma, Alabama. 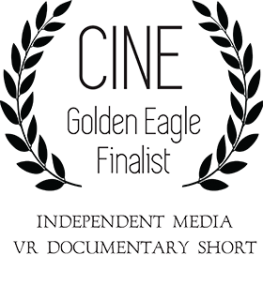 This project is a collaboration between Morgan State University’s School of Global Journalism and Communication and West Virginia University’s Reed College of Media. Bridging Selma is the first in a series of social justice reporting projects called StoryBridge. 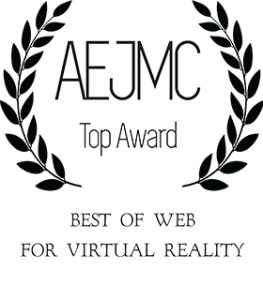 This joint initiative is an experiment in creating a new kind of classroom that explores the uses of emerging technology in crossing divides of race, class and gender in journalism and documentary practice.